Garuda and Naga – Why Garuda and Nagas (Snakes) are enemies? Garuda, the divine eagle, is the vehicle, or Vahana, of Hindu God Vishnu. Nagas or Snakes are his permanent enemies. There is an interesting story in the Purana that explains why Garuda and snakes are enemies. Sage Kashyapa had two wives named Kadru and Vinita. 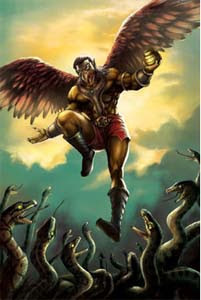 Kadru gave birth to thousand snakes who are considered to be the ancestors of the Snakes on earth. Vinita gave birth to the powerful Garuda. Once Kadru and Vinita put a bet on the color of the tail of the horse Uchaishravas – a seven-headed flying horse that was obtained during the churning of ocean or Samudra Manthan. Kadru claimed the color was black and Vinita claimed it was white. The stake was whoever lost the bet will serve the other. Kadru cheated by asking her sons, the Nagas, to hang on to the tail of Uchaishravas. Thus the white tail of the divine horse turned black as the nagas hung on to them. Vinita and Garuda were thus forced to serve Kadru. They were treated badly by Kadru and her sons. Later the nagas agreed to free Garuda and his mother if he brought the Amrit, or Elixer of life, which is in the possession of Indra, the king of Devas or demi gods. Garuda got Amrit from heaven and freed himself and his mother from servitude. But the cheating and the insult suffered made Garuda the arch rival of Nagas. He even played a trick with the Amrit. Although he gave the Amrit to the Nagas, he asked them to take it after purification of the body. When Nagas went to take bath, Indra took back the Amrit.